All participants will receive a medal, tech shirt, and goodie bag. Flat and fast using city streets, state routes and county roads on the shores of Grand Lake. The course is USATF certified. Miles will be marked and half distance splits will be provided. Aid stations will be available approximately every 2 miles. Port a Johns at every other aid station. Aid stations along the course serve water and other performance fuels. Participants must reach maintain a (15:00 pace). The following vehicle will be on the course that will maintain a 15:00/min per mile pace for the remainder of the event. Participants who fall outside of that pace will be asked to take a sag vehicle to the start/finish area. All aid stations will close in succession with this time plan. 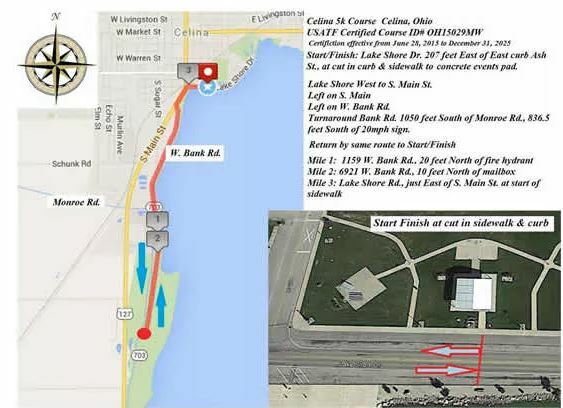 The course will be open until 2:00 PM (6.5 hours Full, 3.5 Hours Half waypoint). Flat, fast using city streets, state routes and county roads on the shores of Grand Lake. The course is USATF Certified. Miles will be marked and half distance splits will be provided. The following vehicle will be on the course that will maintain a 15min/mile pace for the remainder of the event. Participants who fall outside of that pace will be asked to take a sag vehicle to the start/finish area. All aid stations will close in succession with this time plan. This course will be open until 2:00 pm. Flat, fast using city streets, state routes and county roads on the Shores of Grand Lake. Miles will be marked. There will be a water stop roughly at the half way point. This event has a participation limit of 100 teams. Full Relay (26.2mi)-Teams will be made up of 2, 3, or 4.Half Relay (13.1mi)-Teams will be made up of 2 runners.runners. Very limited parking is available at Lakeshore Park. Signs will direct you where to park at Lakeshore Park. Please do not park in any restricted area. Please do not park Downtown Celina You will be Towed. Please be respectful of municipal lots that are provided to service local business traffic. We will have several photographers on the course, at the finish and at the podium ceremony. A week after the event all pictures of you will be emailed to you at the email you provided at registration for purchase. Your number is your identifying feature so please have it visible. Gear check will be located at a tent near Start/Finish Items left at Start/Finish after the finish will be donated to C.A.L.L. clothing bank in Celina. These are considered a hazard while running on roadways. We and the USATF discourage you from using them during this event. You must be able to hear instructions from police and course marshals. Baby Joggers are prohibited on the Full and Half Marathon routes. There are no prohibitions on baby joggers in the 5K. Please do not bring your pet. Buses will be around periodically to pick up participants after their exchange. Wait time will depend on timing but our goal is that you won’t wait much more than 30 minutes to be transported back to the start line. Relay participants are not required to utilize the relay transportation to reach their exchange points, however, it is HIGHLY encouraged due to traffic and road closures. Participants being dropped off by a driver will not be permitted to drive on or across the race course. No “special access” is being granted for this purpose so all road closures will still apply. Any team disregarding the road closures will be automatically disqualified from the race without receiving refund. Relay participates that are not using provided transportation are NOT allowed to park near exchange points. There simply isn’t room. If you aren’t utilizing the provided transportation, you must have someone dropping you off or picking you up. AGAIN, YOU MAY NOT PARK AT OR NEAR EXCHANGE POINTS! Relay participants must carry provided relay batons as part of the relay race. There is no bag drop at exchange points. If you wish to leave items at an exchange point, your teammates will be responsible for collecting items. All items left at exchange points will be thrown away or donated. Participants that miss the bus or otherwise don’t make it to the exchange points are not the responsibility of the Grand Lake Marathon. Make sure you are taking the appropriate bus to assure you arrive to exchange points in plenty of time to meet your runner. No “special runs” will be provided to participates that miss the bus. It may be necessary to walk close to 1/2 mile from Bus pick up/drop off to exchange points. Each relay participant will receive medals and shirts for their respective race relay distances. Medals for the whole team will be handed to the relay member that crosses the finish line of their race and at the time of their completion. It is your responsibility to assure you get the appropriate quantity of medals for your team at that time. How was Grand Lake Marathon Full/Half/Relay/5k/Kid’s Run?